Monday morning I got up nice and early to head to Milton Keynes to watch the marathon. Dan took a little more persuading to rise and shine on his Bank Holiday, but I knew I’d never get there on my own otherwise with how rubbish I am at using the satnav! The night before I had learned that the course had changed quite a lot from previous years and no longer headed around the lake at mile 16, which had been my initial spot I had planned on spectating from. I figured I had more chance of Dan agreeing to come if I bribed him with the promise of a pint and pub lunch in the pub garden on route. I also learned that the half marathoners were running the first 10 miles of the course along with the marathoners but then cutting back through to the finish. I knew several people running the half marathon and wanted to spot them as well so we found a spot against the road at about mile 9 and got there just as the 1:55 half runners were going through, catching sight of one of the guys in my running group as Dan and I scrambled up the bank. We managed to spot several runners from this point, although I never spotted Erin, who was out running her first half marathon. Hayley, who has completed most of the long run training with me over the Winter, but spent much of the last six weeks out from injury was after a Sub 5hour marathon and we spotted her coming through at Sub 10mm pace with Kev (Yes, the Kev that ran 80k at Conti the day before!) I cheered and waved and took several pictures. Lauren also managed to spot me here and waved at me in the crowd! I discovered that I am rubbish at spotting runners in time in the crowds yet Dan has become a pro. 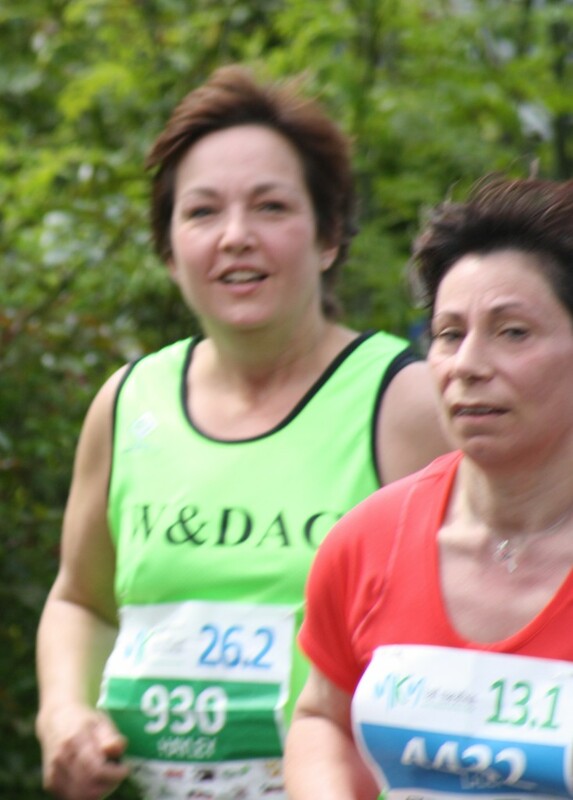 Despite the bright green vests of our club which stand out in the hundreds of other runners I was just really slow at clocking on to when they were coming up. 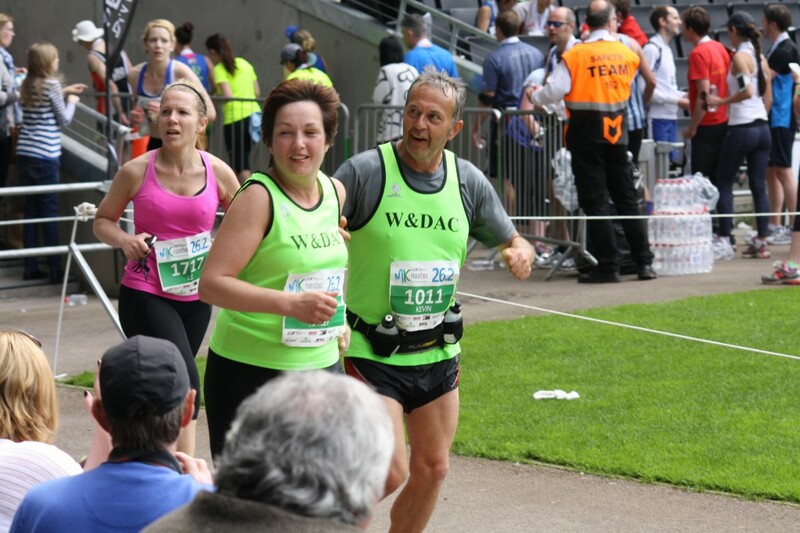 After more than two years of Dan supporting me at races he can spot them a way off, get the camera ready in time and cheer so that they see him. I still need to perfect this! After we’d seen everyone we knew I thought we’d see come through we jumped back into the car and drove to the lake at mile 15.5. Although the race wasn’t going around the lake this year it was still running along a track nearby. There were several other club runners cheering people round stood here so we joined them and they filled us in on who had already been past and what times they were going through at. Once everyone had gone through we all dispersed. Dan and I made a trip to The Hungry Horse for burgers and beers before making our way to the stadium. The stadium finish last year actually made me tingle. You enter Milton Keynes stadium and then run a lap before reaching the finish line. It doesn’t matter how little you have left inside, you pick up your pace. 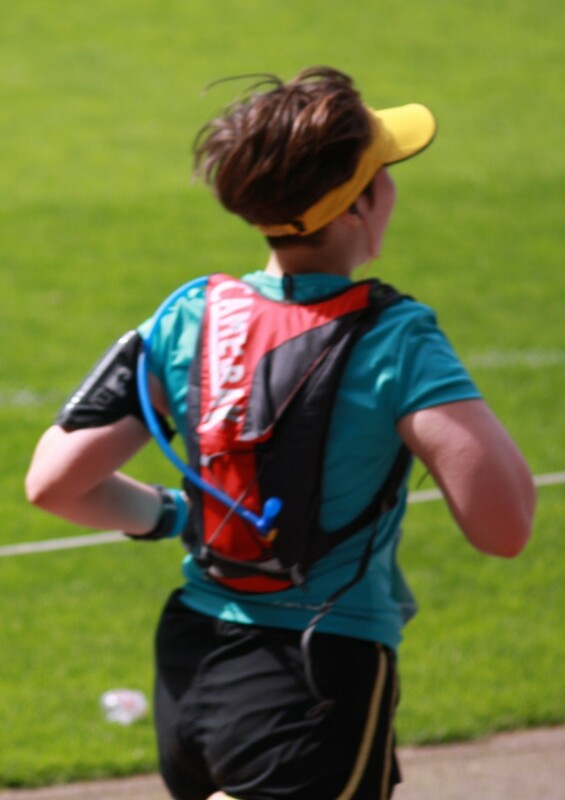 Our club are known for their support, and to have 30+ of the loudest voices in the stadium cheering you on by name as you enter gives you an amazing feeling and I wanted to help recreate that for as many of this years runners as possible. I saw Lauren come through, although again, didn’t spot quick enough to get a face on shot! And then I sat back waiting for Hayley and Kev. They had been very close to the 4:45 pacer at both previous points when I had spotted them, although I was concerned that they had started out too quickly. I was really jittery from 4:45 onwards and when the stadium clock ticked over to 5hrs I commented to Dan that I was worried that something had happened to them. 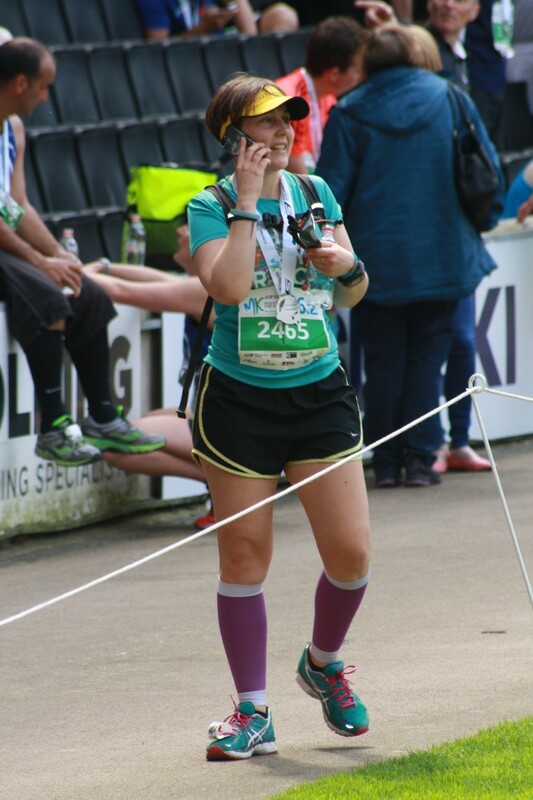 He told me of all the times that he had panicked over me as soon as I was a few seconds over my estimated time, and last year at my Milton Keynes marathon when I really struggled in the heat and came in more than half an hour slower than intended. Thankfully I didn’t have to wait much longer and they soon appeared! Once we’d seen them through the finish Dan and I headed upstairs to meet up with the other half of our club spectators who were sat slightly further round in the stadium. I do love the running community and our club. A great day out, and perfect way to keep moving the day after my ultra! It sounds like you had a ball and did fabulously – well done girl! Managed to catch most people on route! Sounds like a fun day! I think I should join a local running club – I would love this kind of support and camaraderie. Oh it’s without a doubt the best decision I made. It’s so motivating and rewarding being part of something bigger. You did well spotting everyone- it must be so hard in a crowd. 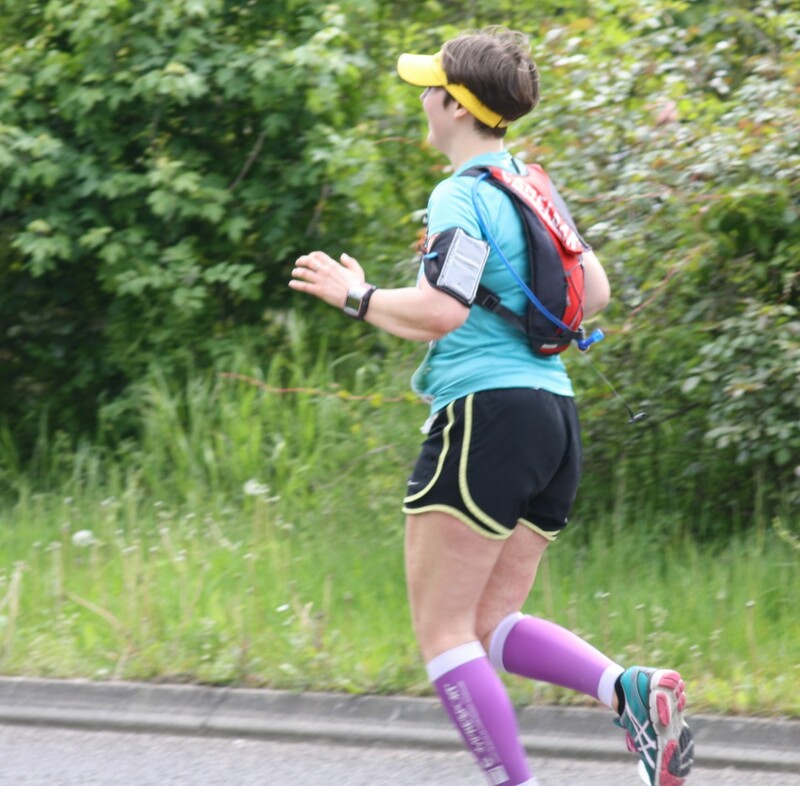 I have watched Andy in a few 10K’s and half marathons and it is really hard to spot people- especially when you start to have an idea of what time they will go past- you start to wonder if you missed them! I really struggled at the time. I knew roughly who would be running and roughly their estimated finishing times, but anything can happen on race day! Dan has become a pro spotter though with all his experience over the past couple of years! Nice shots 😀 I didn’t realise you guys were in the stadium I would have come over and said hi! Yeah, just as you came in on the right hand side. I saw you trying to pick the crowd up as you came through! I did shout, but it was so loud in there. I loved running round the stadium to the finish last year. Oh definitely. I get such a buzz from standing on the sidelines. I know how much I appreciate it when they’re out there cheering for me and it’s nice to return the favour. Great action photos I really want to join a running club. I keep thinking about it, but I think I should do it rather than always thinking about it. Definitely look up your nearest club. Most of them run trial sessions to see how you get on before you sign on the line.